Before I go any further, I need to make a confession (good for the soul, bad for the reputation, right?). We've only been celebrating Christmas as a family for three years. There, I said it. I know, it sounds crazy, but remember, I think I really used to be in a cult (I post about that here)! We didn't not celebrate Christmas because we didn't love Jesus - we did and do. We skipped it the previous years because we thought that every day should be a celebration of Jesus and that Christmas had pagan origins. And a little leaven leaveneth the whole lump, right? I actually do think there are valid arguments for and against, but it all goes back to your heart (as a good friend likes to say). As I've grown in my relationship with Jesus, He's opened my eyes to new ways to share His love with others, and Christmas, to me, is a wonderful time to do that. So, I'm now happy to report that we've shaken off those old shackles and have fully embraced the JOY of Christmas! That being said, Truth in the Tinsel might be wildly popular and I'm just the one mama who didn't know about it already. If that's the case, my apologies. 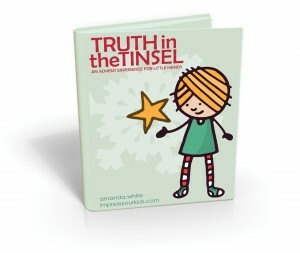 :) However, if you're relatively new to celebrating Christmas, or if you're looking for an Advent experience for little ones (preschool and elementary) who probably won't glean much from the Jesse tree just yet, give Truth in the Tinsel a look. I just downloaded it yesterday (it's an ebook for under $10), and it looks absolutely fantastic! Last year was our first year to get a Christmas tree, and Mary is now head-over-heels for fun ornaments. Making an ornament that goes along with the Christmas story everyday should be right up her alley. But, if you don't want to deal with doing a craft each day, they also have printable ornaments you can download and color instead. I'm sure we won't do the craft each and every single day, so I went ahead and purchased the premade ornaments. This really does look like a great way to get little ones (and me!) to focus on Jesus this Christmas; I can't wait to give it a try! I was wondering what we were going to do in December when we have no CC, and now I have my answer! Oh, and if you look on the right sidebar of 1+1+1=1, you'll see a coupon code for 20% off!